We are used to thinking of ourselves as a marginalized group, and for good reason. We’ve had to struggle against ignorance and prejudice for every inch of social and political space we’ve achieved, and there is still a long way to go. But are there groups that are marginalized within LGBTI culture too? Do bisexuals get the respect they deserve from gay men? Are lesbians’ feminist and other concerns taken seriously? Do “fem” gay men have as much of a voice in the move- ment as “straight-acting” ones? Do LGBTI people with disabilities, or “oldies,” or “fatties” get a fair deal? Are poor or rural LGBTI people neglected in favour of the urban elites? Are those from minority ethnic and religious groupings seen as not belonging? Are transsexuals dissed by some of us, or seen as “freaks,” or laughed at because they “don’t know what they are?” Is their right to have a voice of their own, one that challenges some of our cherished assumptions about sexual identity, fully respected? Is anyone ready to really listen to the intersexed and include them fully in the movement? For years we have been adding letters to our collective acronym, but is the move- ment in Africa still dominated by gay men? Are the rest of us included in the ever- expanding LGBTQIAA(….) label mainly for the sake of political correctness? 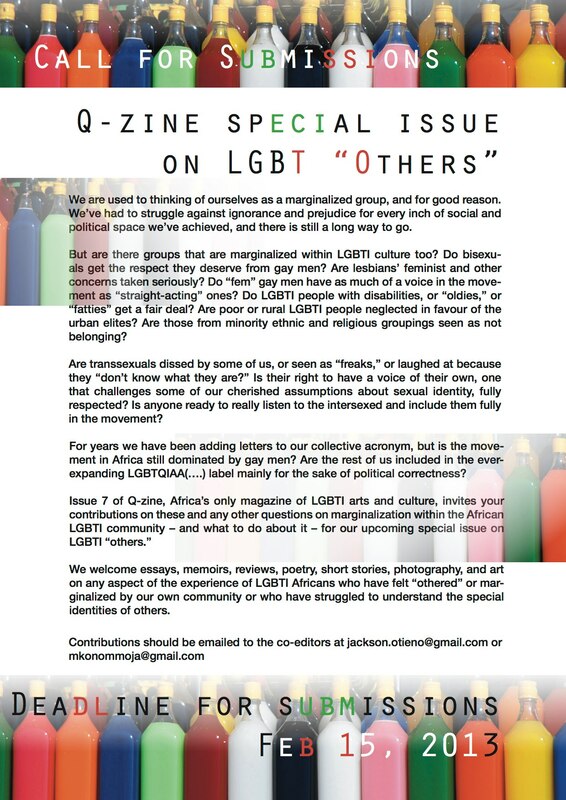 We welcome essays, memoirs, reviews, poetry, short stories, photography, and art on any aspect of the experience of LGBTI Africans who have felt “othered” or mar- ginalized by our own community or who have struggled to understand the special identities of others.